Silicon Valley-based startup Mint, which provides a service that lets users manage their checking, savings and credit card accounts online, will launch a new product on May 6 that lets users track virtually any type of investment account as well. 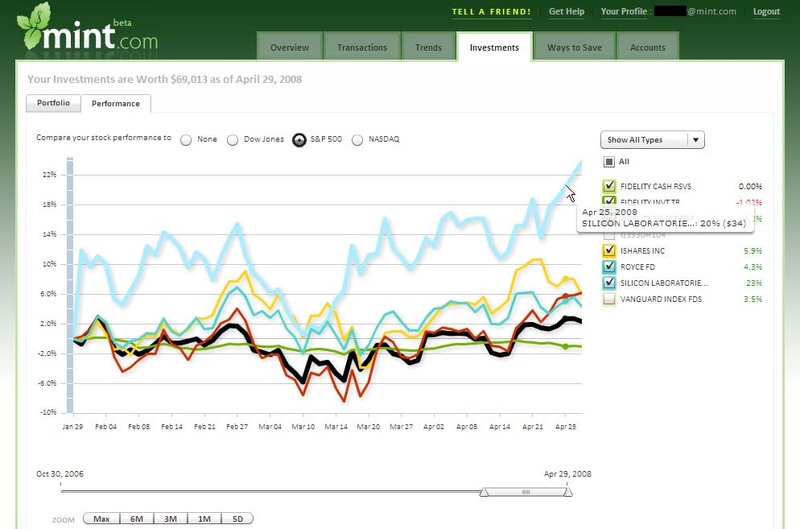 Users will now be able to manage all of their financial assets on the Mint site. With this change, Mint says, 6,500 US financial institutions: 2,520 banks, 1,621 credit cards, and 2,381 investment accounts are supported. Brokerage, IRA, 401k and 529 assets can be managed. For now, only student loan accounts and mortgages are left off, although support for those types of accounts is coming soon. The site will show all your buys, sells, dividend distributions, etc. across multiple accounts. Dive into a single account or equity for its individual performance. Account performance v. the S&P and other indexes is graphed, and account charges are also shown. There are some things you still won’t be able to do with Mint, such as stock trades, bill payments and funds transfers. Mint CEO Aaron Patzer says those features will eventually be added, with a focus on bill payments first. Funds transfers and stock trades are a little stickier, though, and may eventually require state and/or federal regulation of the company. Investments will soft launch on May 6 for very active Mint users and roll out from there. Anyone who wants to be in the beta right at launch (whether they are a current Mint user or not) can sign up at mint.com/techcrunch and will be added on May 6. Other services, including Cake Financial (another TechCrunch40 startup) Vestopia, Covestor, and UpDown also offer investment tracking.